My sister and I got a chance to go up to Stillwater this weekend to watch a little Oklahoma State basketball. This has been an event that hasn’t brought us much happiness lately, but when we get the opportunity to go do anything with OSU, we do it. No question. So, we grabbed the tickets, handed the kids to my husband, and headed down the turnpike. We made the very familiar drive West to our happy place, Stillwater. As we pulled into town, we discussed the best way through town to reach historic Gallagher-Iba Arena, remarking on the landmarks as we passed. Usually what houses we had been in over our span of years in this humble town. You see, my sister and I are very proud alumni of Oklahoma State University. We spent 4 and 5 years in this beautiful place, respectively. At the time, I don’t think we thought of it as beautiful. I’m certain we were clawing to get out. No more school! We were going to be adults! Finally! We want to go back…. desperately. We watched our Cowboys break their horrific losing streak on Saturday! In our elation, my sister looked at me and said, “A beer at Joe’s?” With a laugh I replied I was certain that wasn’t a question, because if she knew me but at all, she already knew the answer. Duh. So we walked down the short street and turned the corner, went to the bar, ordered two Joe’s cups of Bud Light, remarked how wonderful it was to have a choice (in our years it was Coors Light or nothing… ahhhh Stillwater), and headed to the outdoor seating (also new). We walked up to the rail, and immediately began to reminisce. The question we discussed most is why. Why do we love this place so much? It’s a quaint town in North Central Oklahoma. The only things there are the college, a few manufacturing plants, and plenty of farmers. Why is this our happy place when we have the whole world to choose from? The answer is simple. Because it’s where we grew up. No, our family did not live there, and we were not birthed there. We both rolled into town at the ripe old age of 18. But, this is where we grew up. Those city limits are where we were shaped into the women we are today. We learned so much. Not just in the classes we attended (occasionally) and the papers we wrote (last minute) but the life experiences and COUNTLESS mistakes we made respectively. We both earned a world-class education, and two very solid bachelor’s degrees, but we learned from our peers, our mistakes, and ourselves. As we stood on the deck on Saturday, I thought about my boys. I am dying for them to go there. Not just because it’s my school, but because I know what awaits them there. The mistakes they will make, the friends they will learn from, and the life they will form in those buildings and streets. The tears, the laughter, the sweat, and the blood that will make them proud, strong, kind men. My husband and I will lay the foundation, but through trial and error, lots of error, they will find their way. I think that’s what college is all about. (Believe it or not, it is NOT about finding the one you are going to marry your first week at school, so stop trying. You are ruining your first semester.) Sure, we want our kids to get an education. A real actual degree so they can get a real actual job, and become real actual adults; but, we want them to be adults who know who they are and who have made monstrous mistakes. Who know they never want to do THAT again. The years between 18 and 23 are awful. If you really sit down and think about it, they are. When I think about the person who walked into Drummond Hall for Rush Week 1997 I feel sad for her. She was so lost. Quickly in her journey at OSU she ran into some pretty big walls, and knocked herself down something awful. But, she kept standing up. I will never forget my years in Stillwater, and if someone would let me, I would return. However, I am sure I could not live in the conditions I did! Sharing rooms, apartments, dishes, rides, food, and time are things I can barely muster with my own family in my “old” age sometimes. But, cheap beer, penny beer, “pre parties”, laughter, “party pants”, house parties, Joes cup lighting, game days, game nights, “our song”, true love, not so true love, crappy jobs, amazing friends, and early classes are things I will never forget. I’m thankful for my friends, my roommates, and my time in Stillwater. Ride ’em Cowboys. I’ve been thinking all week about writing. The problem is I don’t really have one specific thing on my mind. That, and the fact that I had one really big, heavy post last week, I’m trying to be light this week! One thing I do well is make lists. I generally have a to do list wherever I go. It’s just the way my brain works. If I don’t have a list, things don’t get done. True story. So, today you get a list of all the marvelous things that are on my mind. Enjoy! Fun, right? I used to LOVE cleaning the house. That was back when we had a 1400 square foot house and no children. There was really nothing to clean then. A little wiping of dust and toothpaste and we were good. Then I gave birth to two destroyers of all things clean. Since I started working part time this year, I had planned on spending my time cleaning during the week so I didn’t have to spend 4 hours on a Saturday. That was the plan. You know what happened? There is stuff on TV! No need to worry! Thanks to the handy-dandy invention, Pintrest, I found a schedule! (How did we ever live without Pintrest? I mean, what did we eat?) It’s cleaning in a list! Right up my alley. I’m halfway through the first week. It’s like I’m a veteran at this… So far it has been successful. Let’s hope this continues. Depressing right now. No fun at all. First, let me say this: I am a fan. Always have been and I always will be. No fair weather here. I cheer through the good seasons and the nasty, dirty, ugly ones. This year would be the latter. We had such high hopes. We were killing it until the end of December. Apparently, all of our talent was wrapped up in Michael Cobbins’s achilles. All of that said, a wonderful person, whom you may follow here, gave my family tickets to Bedlam this weekend. The boys were pumped. We donned our orange, our pride, and headed out the door. The team played well. It’s was great. Until it wasn’t. We’ve lost so many. Most of them by just a few points. It’s heart breaking. Adding salt in the wounds, the 2004 Final Four team was honored at the game. All those glorious highlights reminded us of how great it could be. The elation of winning. They joy of hope. The happiness of championships. Then it all came crashing down. I donned my orange again on Monday, and will again on Saturday. It’s what we do. We are loyal. After our heartbreaking loss on Saturday, my husband and I drowned our sorrows in cheese fries. Too full to do anything else, we rented a movie and tried to let the food digest. We finally watched The Social Network (yes, we are behind the times). Good flick, but it has haunted me. Yes, he’s a very smart man, no doubt, but just one simple idea and he’s a billionaire. BILLION. With a B! For months, really years if I am honest, I have been searching for a story to write. My goal is to write a book. Fiction, as I am not that interesting to write nonfiction. I want a character who is average. As you know, that’s kind of a theme for me. It seems though that all of the average people that often frequent the protagonist role do these really extraordinary things. Katniss grabs a bow and starts a rebellion. Harry Potter grabs a wand and takes down a dark lord. Bella Swan, well, does nothing, but I haven’t had any dreams of sparkly vampires like Stephanie Meyer did, so I’m out. I have no idea what I want my seemingly average protagonist to do. Mark Zuckerburg was drunk and came up with his idea. Me, not so much. The best idea I have had while under the influence was to make Mac and Cheese. Again, true story. So, I’m waiting for inspiration to strike. Any day now. So, while I wait, I will clean my house, cheer on my Cowboys, and write this blog. Lucky you! If you have an idea for me to write about, send it to me. I’ll share my profits with you. It seemed to work well for that Eduardo guy that helped found Facebook. Ok, so this one scares me. Mama always said not to talk about religion and politics, and I’m going to do both. It is something that weighs heavy on my heart. If you don’t like what I said, that’s fine. Ignore me. It won’t hurt by feelings. I will go back to talking about kids and CrossFit next week. Oh, Jesus take the wheel. We will see where this goes! I am a Christian. I have been since I was 8 years old. I accepted Christ and was baptized on Easter Sunday by a man named Jack Johnson. Not the singer, although that would have been awesome! Through this journey of religion I have had my ups, downs, doubts, and triumphs. If anyone tells you to become a Christian because it is an easy life, they are full of it. Seriously. I have doubted my faith daily sometimes. It’s ok. It happens. I am nowhere near perfect. No way, no how. It can’t be done. I screw up daily, hourly, sometimes minute by minute. I drink wine, I cuss like a sailor, I yell at my family, and many other egregious errors (all of those today, except the wine as it is 10:00 in the morning). Anyone who tells you these things not a Christian make, is lying. Sorry. Let me let those of you who do not believe in Christ, and some of you who do believe, in on a little secret. EVERYONE screws up. No one does it right. Romans 3:23 states, “For ALL have sinned and fall short of the glory of God.” Did you get that? All. No one is exempt. We like to walk around and say things like, “Well, I haven’t killed anyone,” or “At least I didn’t do THAT.” It doesn’t matter. We all live in our own mess of crap. Does God know this? You bet He does. Does it change His love? You bet it doesn’t. So now what? We need to realize that every single person on this Earth is dealing with their own stuff. The Bible also states in Matthew 7:1 “Do not judge, or you too will be judged.” Phew. Let’s let that sink in a little bit. If I start screaming at you that what you are doing is awful, nasty, and dirty, you can do it to me? Hmmm. I don’t want any part of that. But, we do it. Don’t we. There are a lot of articles and blogs and opinions about homosexuality. The Bible states it is a sin. It does. I’ve read it. You know what it also states is a sin? Divorce, adultery, greed, working on Sunday, eating pork, and a multitude of other things. Are you shifting in your seat? You should be. We look over those, right? I mean, after church one day where I didn’t tithe because I was redoing my kitchen and needed the money, I went to Rib Crib (where people were working on a Sunday) and ate pulled pork. I mean. I should be shot dead. But, it’s ok. Right? We can’t pick and chose what we scream and shout about. Hang on, I can hear you screaming, “But it’s our job as Christians to help the lost along the way.” You are right. It is. To help. Not to scream, protest, hurt, slander, deny, and maim. To help. To love. You have told everyone your point. They heard you. Now stop. You know what, homosexuality is not any different from me eating the pork tenderloin that is in the freezer, or screaming obscenities at CrossFit (I do it, those around me know), and you don’t write articles about that. You are not lobbying against that. You are not putting out legislation against that. So stop. Put down your picket signs and your hatred. Don’t deny someone the right to love because it is different from what you do. Homosexuality is simply a label. Behind those labels are people. Real human beings with feelings, and desires, and goals. How would you feel with a label strapped around your neck? If people yelled in your face, “Don’t let her have the right to eat whatever she wants because she’s a glutton.” How about this, “He shouldn’t get a paycheck because he’s greedy and just going to build a ridiculously big house and make my house look bad.” Wouldn’t be a lot of fun, would it? I have read the Ten Commandments. I have read the Golden Rule. I have read the Great Commission. There are two lines of scripture about homosexuality and there are a million more about loving everyone. The Bible talks more about greed than homosexuality. Yes, I’m talking to you in your big house, reading this on your smart phone or tablet, wearing your über expensive clothes (that’s me as well). So shut up. Stop hurting people and denying people rights. That is not your job. Ever. God did not say “put an end to homosexuality.” He said “Love your neighbor as yourself.” We ALL fall short. No one is perfect. Stop fighting and start loving. For Those Who Crossfit, and Those Who Don’t. I wrote this with CrossFit in mind, but can certainly be applied to any workout, or life situation you have. Now, if someone will tattoo this on my hand, I’d appreciate it. We all have that story. You know, the one of your first day of CrossFit. How you walked in feeling relatively in shape, and learned by the end of the warm up you were doomed. Yep, my story is just the same as yours. It’s full of tears and pain and desperation. I’m sure our endings are the same as well, that by the time you peeled yourself off the floor, gathered up your jacket and water bottle, and found your ability to drive home, you were hooked. Resolved that you could do better. Certain that you could beat that time. I had committed myself to two workouts a week. I was sure that would be plenty to get in the shape that I had desired. You know, I just wanted to look good in a bathing suit. After three months of twice a week workouts, I stepped up to three times a week. A few months later, I was going every chance I got. While I have family, work, and life commitments, just like the rest of us, I still maintain that schedule. Every chance I get, I’m there. That was two years ago. So, my times should be rocking… right? I should be posting some crazy fast Fran, Diane, and Elizabeth times… right? Nope. My times are average. My body is average. That’s me; I’m just your average CrossFitter. Life for an average CrossFit girl can be quite frustrating. I have my “rabbit” girls. You know, those that I am continually chasing and am certain I will never catch. I have those I can beat, those that I can hang with, and those that I will never measure up to, for now. My times have improved tremendously. My body has changed drastically. The amount I can lift, swing, and kip has grown leaps and bounds from that first fateful workout. I’m proud of my accomplishments and what my body can do, but I’m average, and that’s ok. Or is it? I find myself looking at the workout, seeing other’s times, and deciding what a “good time for me” would be, and then I try to hit that goal. I mean, I certainly don’t want to set myself up for failure… but what if I am? By deciding where I should be I am not allowing myself to see where I can be. We average CrossFit girls can fall into a trap. We know we aren’t always going to finish last, but we seriously doubt we can finish first. We stand in our own way. I would be so frustrated if I listened to someone else try to figure out what was “good enough,” so why should I do it to myself? The reason I find myself in the gym as much as possible is because CrossFit awakened this desire in me. This intense craving to be strong, not just toned; to have an excellent body fat percentage, not just a size 4; to explode past limits I had unwittingly put on myself, not just be good enough. So, why is it that I now find myself setting mediocre standards? It’s just not ok anymore. So, how do I do it? How do I stop this vicious cycle of weakness? I will walk into the gym, look at the workout, and not set a goal time, but just see what happens. A lot of times, when I am setting my “good enough” time I find myself slowing down, or allowing myself more rest times, because I was a little ahead of where I should be. How ridiculous is that? What if we average girls walked into a workout without any preconceived notions. Instead of finding where we should fit, we should walk into our favorite box, garage gym, or your favorite place to WOD, and simply kill it. We should push ourselves three more reps when we feel like we are going to stop. We break for only 5 seconds instead of looking at the clock during our breaks to make sure we are “on track.” The only way to break the “average” cycle is to push yourself further than you thought possible. One of my favorite ways to push through the average stereotype I place on myself is to up the ante. Not only should we push ourselves during the workout, blasting through the breaks and the rests, but grab a heavier weight than our comfort zone and see what happens. When we are comfortable with a weight, and it begins to feel “easy” or becomes one of our favorite things to do, we should push it further. If the prescribed weight for a kettlebell swing is 35lbs, I will pick up a 45lbs kettlebell and deal with being last (if that is the outcome) because I know it is forcing me to be stronger. I will add ten pounds to my lifts, and see what happens. I will spend time before and after the WOD working on my weaknesses, and stay on the pull up bar three more reps than I normally do. I will push myself harder and farther. I mean, how do you think those “rabbit” girls got there? It’s time for we average CrossFitters to stop should-ing all over ourselves. When we put ourselves where we thing we should be, we are not allowing ourselves to see where we could be. It’s time for us to face our weaknesses, push through the pain, and explore the world of the above average. Don’t be happy with good enough. Stop using the phrase “that’s good for me.” Throw yourself out of the comfort zone and into the bad-a** zone. I’m a bit neurotic. Gasp! Shocking, I know, but it’s true. I like to think it’s one of my most endearing qualities. I’m sure other’s would disagree. With this “endearing” neurosis comes a lot of strange activities. Some may call it OCD… I call it quirks. Mainly, let’s talk about sports. I have this irrational belief that I can change or control the outcome of a sporting event by following a few steps. During OSU football season I wake every Saturday morning and head straight to Facebook. I post the same comment. Every. Single. Saturday. It works. The only time I did not do this was when we played West Virginia, and we all remember how lovely that turned out. I can hear you now, “But we lost two other games after that.” You are right, there is more to the equation than the Facebook post. Next is the clothes. I wear the same OSU shirt. I can mix up the pants, but the shirt has to be Pistol Pete. The same goes for my family. They have their game day attire as well. It is imperative that they wear it. Still not convinced? My husband had to change his clothes during the OU game to go to a funeral, and I wore a new coat to the Cotton Bowl. Case closed. I’ve been known to “watch” a game from the kitchen because our luck changed when I left the room. I am certain I am not the only one who behaves this way. As the Bud Light commercial goes, “It’s only weird if it doesn’t work.” It works. Every time. Here is the problem I am having now. I have not figured out my mojo for basketball season. I hadn’t been posting my Facebook status, because one, we were winning without it, and two, there are a lot of basketball games, and I was certain I would be defriended if this continued. I also cannot wear the same shirt that many times a week. I don’t like to do laundry that much. So there is my issue. I tried to remedy it and completed all of my steps for Saturday’s game, and we lost, at home. Not cool. We are losing games and it is all my fault! This is so much pressure! I also cannot figure out how to sit during the games. I used the phrase, “I don’t know what to do with my hands” about five times against Baylor the other day. This is bleeding into other teams as well. I mean, I was cheering for the Broncos yesterday, and look what happened. I am killing people’s dreams over here, all because I cannot figure out how to sit. It’s a rough problem. So, we will see tonight. I have posted my game day post on Facebook. We are not wearing our game day attire, but mainly because it’s laundry day. If someone could tell me what to do with my hands I would appreciate it. I mean, it’s Big Monday again. I just hope I’ve done my part. 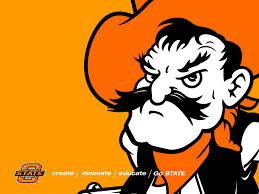 Go Pokes, beat Iowa State.